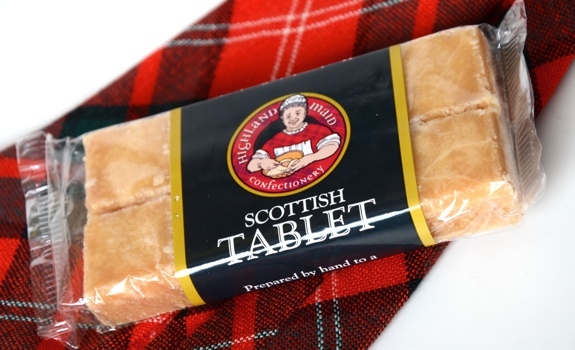 Highland Maid Scottish Tablet, paired with a wee bit of tartan goodness. While ambling about in the Scottish highlands roughly a decade ago, I learned of the glories of both Scottish tablet and Orkney fudge, both crazy-sweet, super delicious confections that still remind me of train trips past shaggy-looking cattle and rocky fields of squishy heather. When I visit Scottish import shops, it’s one of the treats I check for, hoping they’ll have some next to the Edinburgh rock and the tins of Irn Bru. One such shop, on Calgary’s busy 17th Avenue, had what I was looking for. While I doubted a bar of tablet would taste as good in Canada as it did while reading the a copy of the Scotsman on a train to Glasgow, I bought one anyhow. The Look: No frills. Clear-plastic-wrapped bar of tablet, which has a creamy golden colour with visible white sugar-crystal flecking. Possibly slightly past its prime. The Taste: Super-sweet, but not quite in Cadbury-Crème-Egg country. The flavour is sugary caramel with butter and cream. The texture is rough and granular, though the bar quickly dissolves into a sweet liquid as soon as it hits your tongue. It’s not at all sticky or gooey, nor is it hard-candy hard. A small amount of pressure from your teeth is enough to crack off a piece of the stuff. The Taste (with coffee): To verify the Thistle Products website’s claim, I also tried some tablet with a rich, dark coffee – a cup of Starbucks Christmas Blend Decaf brewed from beans I picked up over the holidays – and it was good. The bitterness is balanced nicely by the tablet’s sweet cream. If you’re going that route, make it black coffee; adding milk and sugar would be redundant. 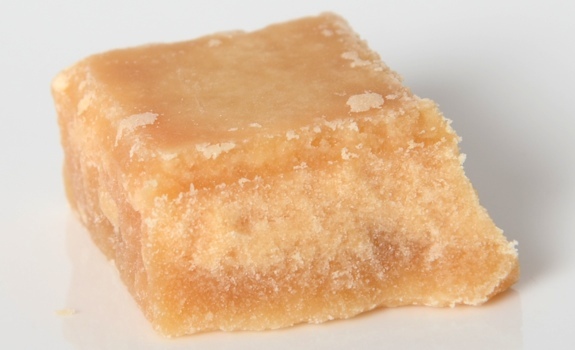 A single chunk of Scottish tablet. It's not smooth like fudge, nor is it as rough as a sugar cube. Cost: $3.95 for a 100 gram bar at the Scottish Shoppe in Calgary. Value for cash money: Good for an import candy. It’s sweeeeeet, so a little bit goes a long way. Availability: In Calgary, at the Scottish Shoppe on 17th Avenue SW. Check your favourite local U.K. import shop. Nutrition? : No idea. Nothing listed. Sorry. The verdict: Yummy. An occasional treat, not to be consumed all at once. Superb with black coffee.